Would you like to capture figures full of life and vitality in your sketches? 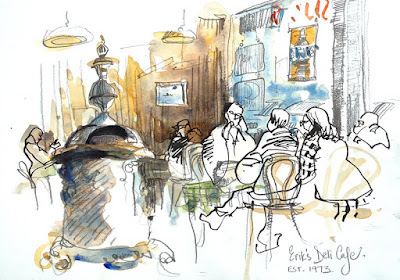 Have you wondered how to make people an integral part of your sketches? Then this is the workshop for you! In the first part of this workshop, we'll focus on learning to capture people quickly in our sketches. To do this, we'll borrow from animation in drawing gestural figures based on the concept of a 'line-of-action'. 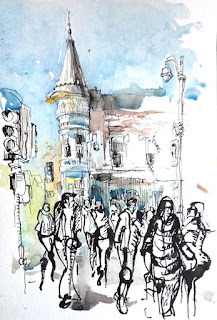 In the second part of our workshop, we will create a composition where we use a contrast of styles: gestural drawing for the figures combined with a different style or tool to capture the historical architecture of Manchester. By combining two styles and/or tools, we'll explore how even very loose figures can be incorporated into sketches and how contrasting styles can be used for a richer capture. We will start with a short discussion and demo of gestural figure sketching. Using what we learn, we'll sketch people, capturing different actions and activities. Then we will regroup, share our work and discuss it. In the second half of the workshop, we'll look at combining two different styles and media: one for capturing the people in our scene and another to capture the architecture. 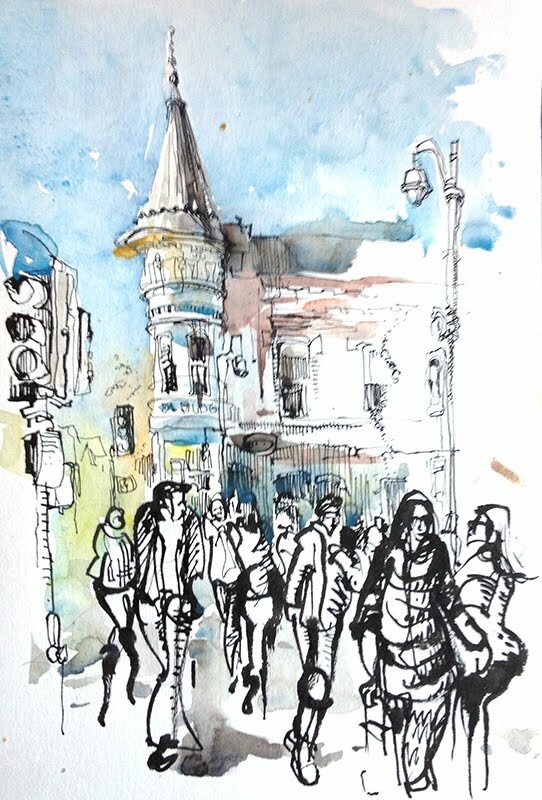 The instructor will do a 20-25 minute demo and then the class will work on a final piece that combines people and architectural sketching into a study in contrasts. Exploring using contrast in style, medium and techniques for a richer capture. At least one other mark-making to9ol with a different character: a different pen, colored pencils, markers etc. Note: Keep your kit light as I prefer that you walk around, change positions often and get up close to the action.